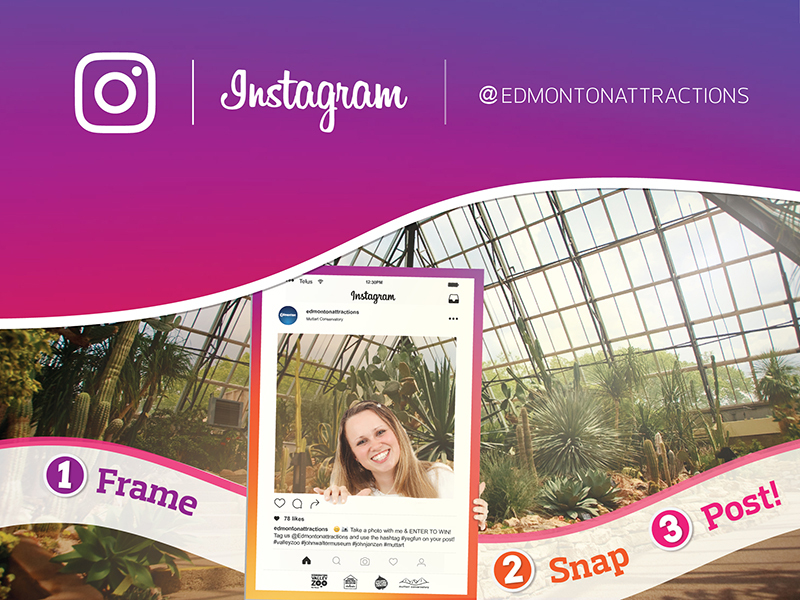 On your personal Instagram, post a photo of you and/or friends and family, holding our giant Instagram frame, while visiting a City of Edmonton attractions or site, such as the Valley Zoo, Muttart Conservatory, John Janzen Nature Centre or John Walter museum. Photos can include you while at the attraction, what activities you did, sights you saw, food you ate, anything! There will be a winner each month for a total of up to 12 winners! Please make sure you have everyone’s permission to share their image in the photo if your image has identifiable people in it. You must include the hashtag #yegfun, tag @edmontonattractions and follow @edmontonattractions to qualify. Submission Dates: Photos will be accepted from January 1 to December 31, 2017 on Instagram. Judging Process: Our City of Edmonton–Citizen Services social media team will act as judges to collectively and anonymously review the entries and will narrow down to the top 3 winners, based on creativity! If you have any questions, please email edmontonattractions@edmonton.ca. There is no purchase required to enter the contest. The chances of winning are dependent on the number of entries received. Contest is open to City of Edmonton Attractions Instagram followers, who are Edmonton Capital Region residents and are 18 years of age or older. If a winner is under the age of 18, a parent or legal guardian may accept the prize on their behalf. “Follow” us at https://instagram.com/edmontonattractions/. Contest is not open to current Community and Recreation Facilities employees. Contest begins on Friday January 1, 2017 and ends on Saturday, December 31 2017. Interested followers can opt themselves in to enter the contest during this period. In order to receive their prize, each contest winner must correctly complete a mathematical skill-testing question, and sign a standard declaration and release form confirming compliance with the contest rules together with a consent for The City of Edmonton to use the winner’s name and likeness online and in print in any other media in connection with the contest and for advertising and promotional purposes without additional compensation. Contest winners are responsible for picking up the prizes during normal weekday business hours within three (3) working days of contest winner successfully answering the skill-testing question. Non-compliance within this time period may result in disqualification and selection of an alternate winner. Return of any prize notification as undeliverable or failure of the prize winner to successfully answer the skill-testing question within three (3) working days of notification of selection may result in disqualification and selection of an alternate winner. Entrants agree to abide by the terms of these official rules and by the decisions of the contest judge, which are final and binding on all matters pertaining to this contest. By entering, participants release and hold harmless The City of Edmonton, its parents, subsidiaries, affiliates, directors, officers, employees and agents from any and all liability or any injuries, loss or damage of any kind arising from or in connection with this contest or prize won, including any travel related thereto. This contest is in no way sponsored, endorsed or administered by, or associated with Instagram. All participants are providing information to City of Edmonton and not to Instagram. This personal information is being collected under the authority of section 33(c) of the Freedom of Information and Protection of Privacy Act, R.S.A. 2000, c. F-25 (FOIP) and will be used for contesting purposes. It is protected in accordance with the privacy provisions of FOIP. If you have any questions about the collection, you may contact Christina Chu, Market Planner, at Christina.Chu@edmonton.ca., or at 780-496-4620, 14th Floor, CN Tower, 10004-104 Avenue, Edmonton, AB T5J 2R7.